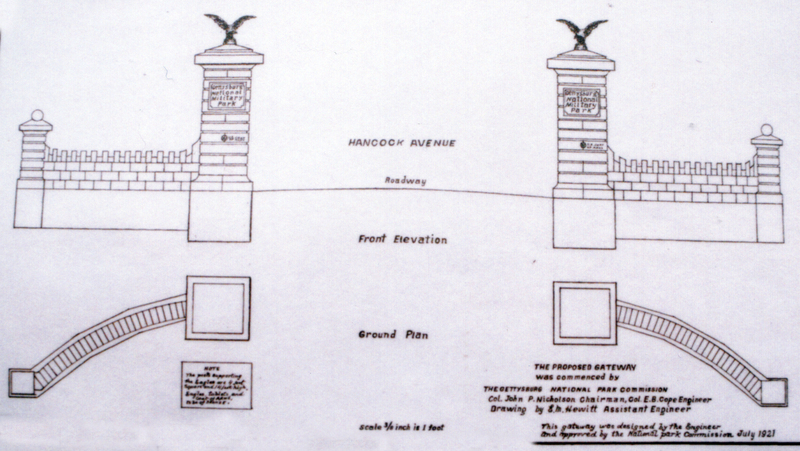 The design of the Hancock Avenue Gate was submitted by E.B. Cope and approved in July of 1921 by the Gettysburg National Park Commission. The drawing was done by Cope’s assistant engineer, likely because Cope was 88 years old when he designed the gate. Cope would die five years later at his home on Baltimore Street in Gettysburg. Cope’s death at age 93 is referred to in some Park documents as a possible end-date for the “commemorative era,” in which management of the Park was influenced by or directly under the supervision of Civil War veterans.This drawing was made in July of 1921 [NPS].